Join us on Sunday, 11/18, 4:00 PM – 5:30 PM, for our fifth gathering for Sing It! Seattle. This week, we’ll spend the 90 minutes learning the David Bowie classic: Space Oddity. Take your protein pills and put your helmet on! We’re ready to go with some fun harmonies and keyboard backup from the amazing Andrew Shields. This $5 event is open to everyone regardless of vocal ability. There’s no audition, no commitment and no requirement to read music. Just a spirit of fun and adventure. 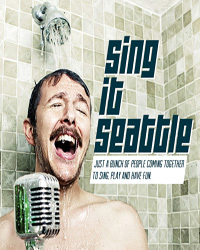 Sing it Seattle! is music and singing that’s spontaneous, creative and fun. And it all happens in the comfort of Unexpected Productions’ Market Theater, a spacious sound-rich theater in the heart of downtown Seattle.